Make pie crust as directed on box for Two-Crust Pie using 10-inch tart pan with removable bottom or 9-inch glass pie pan. Place 1 crust in pan; press in bottom and up sides. Trim edges if necessary. Place oven rack in lowest rack position; heat oven to 375°F. In 8-inch skillet, melt butter over medium heat. Add onions; cook and stir until tender. Reserve 1 tablespoon each chopped tomato and sliced olives; stir remaining tomato and olives, the garlic powder, cumin, pepper and chiles into cooked onion. In small bowl with fork, beat eggs and red pepper sauce; reserve 2 teaspoons mixture. Stir in 1/2 cup of the Monterey Jack cheese and 1/2 cup of the Cheddar cheese. Sprinkle remaining cheeses in bottom of pie crust-lined pan. Spoon onion mixture evenly over cheese. Carefully pour egg mixture over onion mixture; spread to cover. Top with second pie crust; seal edges. Cut slits in crust in decorative design in several places. Brush with reserved egg mixture. Place pie on lowest oven rack; bake 45 to 55 minutes or until golden brown. Let stand 5 minutes; remove sides of pan. 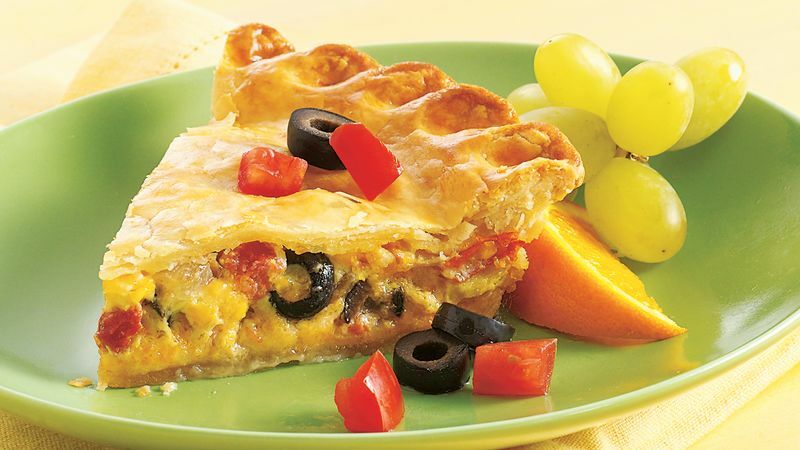 Serve warm with sour cream, salsa and reserved chopped tomatoes and sliced olives.